Workman Publishing Company, 9780894807527, 432pp. 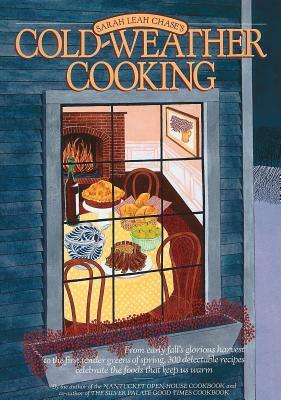 Whether your winter blows with snow and rain or is just a sunbelt state of mind, a trove of delicious, soul-warming fare awaits in COLD WEATHER COOKING, from the author of The Nantucket Open-House Cookbook with over 214,000 copies in print. Guided by a sense that winter is the season for seasonings-from ginger, garlic, and rosemary in Mixed Winter Squash Provencal to the cilantro and walnut crust on a dazzling Roast Rack of Lamb-this gifted cook and author provides dishes that are even gutsier than her summertime favorites. She pays special attention to the late harvest, helps cooks make the most of fall fruits and vegetables, offers chapters on winter grilling and cooking over the hearth. More than 300 recipes range from bracing drinks for the first sign of autumn to glorious spring dishes for an Easter celebration. Warm Tomato Pie. Wild Rice, Mushroom, and Oyster Bisque. Pasta with Gorgonzola and Spinach. Plus Scallops in Sweet and Hot Lime Sauce, Deviled Beef Ribs, Broccoli with Toasted Hazelnuts and Pancetta, Sweet Potato Pancakes, Pumpkin Bread Pudding, Chestnut Mousse Cake, and Christmas Truffle Tart. Selection of the Book-of-the-Month Club's HomeStyle Books. 112,000 copies in print.